A HIPPO'S HOW IT'S MADE - My Ladybugs! Hello there my fellow fusers... this one is just for you! 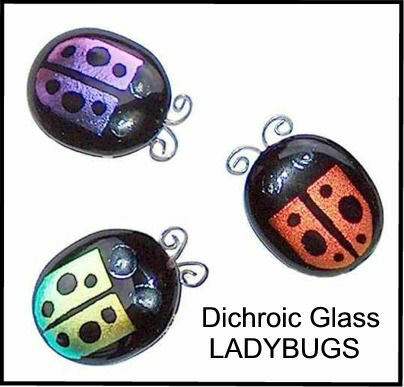 I've created this page to share with you how I created my lovely little fused glass ladybugs. Now don't for a minute think :) you have to stop at ladybugs... I think it might be super fun to try other insects as well... Goodness, imagine the cool little Bees, Butterflies, Dragonflies, Beetles, etc you could create... and you could make them into fridge magnets, buttons, jewelry! I hope you have fun with this project... and please let me know what fun critters you create... pictures would be AWESOME! I cut off the edges using mosaic nippers, glass cutters or grozer pliers to make them look a bit like stretched out stop sign. I nip the edges to give the glass a head start in rounding up the edges and also to minimize the distortion to my dichro design during firing... cause the glass moves as it fuses... and the metal / dichro doesn't. I sandwich my antennae between the two pieces. I make the antennae using high fire nichrome wire. I glue the pieces together as I go with GlasTac glue and assemble them right on the shelf. For the top layer I use 2 pieces of glass. And a small piece of black glass (approximately 1/4" x 5/8") for the head. For the body, I carefully cut or nip the bottom edges off using mosaic nippers or grozer pliers and if needed I round the edges just a bit on my glass grinder. I then use a dremel with a flex shaft attachment to etch the away the dichro to create my design... I etch the black line separating the wings and I etch the 3 black dots. Be sure to clean and dry the etched piece off really well before assembling and gluing... alcohol works great. For the head, I carefully nip the top edges back a bit and I create the eyes using tiny 1/8" squares of silver thin dichro on clear (I attach the eyes dichro side down). Again, I glue the pieces in place as I go with GlasTac glue and assemble them right on the shelf. They should now look quite a bit like ladybugs! I fire these in my small hotbox kiln so I can carefully watch them and so I can vent the kiln down and stop the fusing process when they are the exact rounded shape I want.